Ooredoo Group confirmed today it has successfully trialled the first International 5G call in the Arab World. Ooredoo’s call took place on Tuesday 22 January 2019, between Sheikh Saud Bin Nasser Al-Thani, Chief Executive Officer, Ooredoo Group and Sheikh Mohammed Bin Abdulla Bin Mohammed Al-Thani, Chief Executive Officer, Ooredoo Kuwait. Also present were senior representatives from Ooredoo Group, Ooredoo Qatar and Ooredoo Kuwait, in addition to respective government officials and invited media. The call was originated by Sheikh Saud from Ooredoo’s headquarters in Doha, and received by Sheikh Mohammed in Ooredoo Kuwait’s headquarters. It took place using 5G CPEs connected at 5G speeds of up to 1 Gbps showcasing the incredible potential of 5G. Ooredoo Qatar became the first operator in the world to launch a live, commercially available 5G network in May 2018 and has since worked tirelessly to ensure it will be ready for use as soon as 5G devices become commercially available. 5G is set to revolutionise mobile and fixed connectivity, with super-fast internet speeds, extreme throughput and low latency. 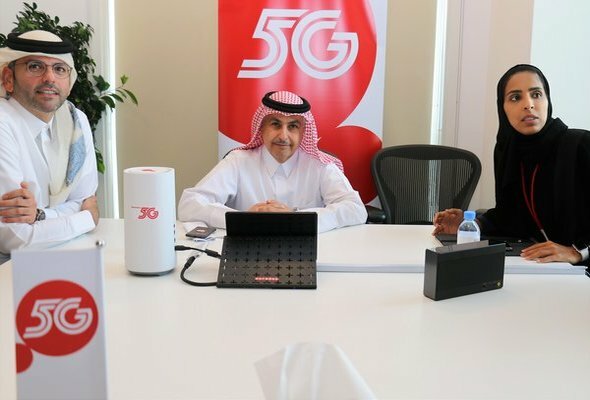 Also, Ooredoo Kuwait had announced the launch of the trial 5G for its customers last June 2018. The 5G trial launch came as the company prepares to release the biggest network of the revolutionary internet of the future across Kuwait in 2019. This comes in tandem with Ooredoo Group’s plans to roll out 5G across its markets, following the launch of the new high capacity technology in Doha. Detailed 5G network testing is now underway across both the Qatar and Kuwait 5G networks, and plenty of the incredible possibilities of 5G have already been showcased by Ooredoo, including a driverless aerial taxi, 5G broadband in a moving vehicle and never-before-seen gaming quality. With this announcement, Ooredoo joins major global telco players in successfully trialing 5G calls. For more information on Ooredoo and its progress towards 5G, please visit ooredoo.qa.